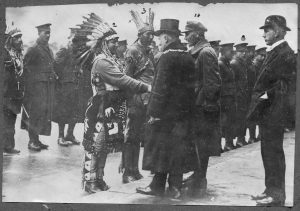 While Canadians want to learn more about Indigenous history and culture, and the history of relationships between Indigenous people and settlers in what became Canada, we haven’t looked very much at the history of alliances and friendships between these same people. Joan Sangster, in her presidential address at the 2017 Annual Meeting of the Canadian Historical Association at Ryerson University (“Confronting Colonial Pasts: Historicizing a Century of Canadian Political Alliances”), talked about historical alliances between non-Indigenous individuals and organizations, and Indigenous people, and how these alliances need further exploration. She gave several examples of non-Indigenous people working as friends and allies of Indigenous people, or at least, trying to, however problematic some of their efforts might have been. I have a particular interest in one of the women discussed in her address who is a fascinating example of people “with good intentions,” such as those that Celia Haig-Brown and David Nock wrote about several years ago. Much of the recent work that has been done by scholars of gender and empire is interested in how white women (including feminists) were complicit in colonial endeavours, working for missionary societies, schools, and women’s organizations. Much less has been written about women who tried to work as allies with Indigenous people, often against dominion governments and the British Crown. I think that we need to acknowledge that alliances like these organizations have been a part of our history and that we need to better understand them. Uncovering this history helps break down the dichotomy of Crown – First Nations relations that dominates representations of Canada’s colonial past. The relationships were not all homogenous racism on the part of non-Indigenous people. The situation was more complicated, the relationships more dynamic and varied. In part, this means that the past was not so radically different from the present in terms of attitudes and activism, and has implications for how we think about working towards reconciliation with Indigenous people in Canada today. I am a settler scholar, and I have encountered this theme of alliance in my research over the past decade. I completed a PhD at OISE/University of Toronto in History in 2010, with a thesis on the Six Nations of Grand River in the early 20th century. I was particularly focused on Haudenosaunee Christian women’s experiences, and found evidence of that these women worked to improve their community in a wide range of ways: through churches, in day schools on the reserve, and through patriotic organizations during the First World War as well as other kinds of voluntary organizations in the interwar years. After finishing my PhD, I taught Indigenous and Canadian history at several universities and colleges, including at the University of Toronto, Trent University and Ryerson University, and also worked as a researcher for the Truth & Reconciliation Commission. I then held a SSHRC postdoctoral fellowship at Trent University, supervised by John Milloy, where I began a project focused on Indigenous women and men who worked as teachers in day schools in southern Ontario in the 19th century. Two years ago, I began working for what’s now called the Ontario Ministry of Indigenous Relations and Reconciliation (it was then called the Ministry of Aboriginal Affairs) conducting research and working on public education initiatives. My academic research and my current government work has led me to think about two things that have been treated separately: being a settler ally and the history of “good intentions,” and the centenary of the First World War. Ten years ago, while working on my dissertation on the Six Nations of the Grand River in the early 20th century, I stumbled across Sarah Robertson Matheson and Mary Pamela Milne-Home (pictured above) while researching the response from the Six Nations of the Grand River to the First World War. I was particularly interested in what Six Nations women were doing, but needed to contextualize this aspect of my work by investigating what Six Nations men did during the war as well. I published my research on women’s work in the Six Nations Women’s Patriotic Society, and on the first and only Indigenous woman to enlist in the First World War (Edith Anderson Monture) in a book chapter in A Sisterhood of Suffering and Service: Women and Girls of Canada and Newfoundland during the First World War. In searching what the men were doing, I came across the story of a group of Indigenous soldiers, many of them Six Nations, who toured England and Scotland for “patriotic and recruitment purposes” during the war. I searched British newspapers and found articles about their tour, including some that mentioned how a woman, Mrs. Mary Milne-Home, had welcomed them to Glasgow when they arrived in the city. I found other newspaper columns of hers in Scottish papers, and I had also seen letters from Milne-Home in the records of the Department of Indian Affairs (she wrote to Prime Minister Mackenzie King, Governor General Lord Byng, High Commissioner of Canada, Peter C. Larkin, and Duncan Campbell Scott, Superintendent of Indian Affairs) as well as the records of the British Foreign Anti-Slavery and Aborigines Protection Society. I was intrigued that this English woman was so passionate about the rights of Indigenous people in Canada, and the treatment of Six Nations veterans at home after the war, and especially in regards to land and political matters at Grand River. In one letter she wrote “I worked for the wounded Canadians during the War, and I stand by Canada when I hear her aspersed, but this injustice will do her harm in the eyes of the world, and surely it is not too late to undo the wrong and treat these gallant Allies of the British as they should be treated.” Matheson, the second woman whose letters I’d found in Canadian archives, had also written to Canadian officials arguing that the Six Nations should be respected as allies of Britain, that treaties had been broken, and she wrote specifically against the Soldier Settlement Act which gave tracts of reserve land to individual veterans. The head of Indian Affairs, Duncan Campbell Scott, discouraged government officials from replying to these two women, saying “they are supplied with misinformation by Levi General… and nothing will shake their belief in the perfidy of the Department of Indian Affairs and the Canadian Government.” These two women seem to me to be clear examples of Haig-Brown and Nock’s people with good intentions, or as I like to think of them, as allies. Microbiography is an important research method for me, and so family history and genealogy are central to my research process. I was already conducting research on Six Nations soldiers and their families, and so also began digging into the family history of Milne-Home and Robertson. I traced both women’s family histories, and learned that both were part of transatlantic empire families. Milne-Home was English, and the great great great granddaughter of Sir William Johnson, the first superintendent of Indian Affairs in North America (who married Molly Brant, Joseph’s sister, after the death of his first wife). Mary was born in England but spent her childhood in Fort George, Jamaica where her father was stationed. She married David Milne-Home, a Scotsman and colonel in the Royal Horse Guards, and lived outside of Edinburgh at the family seat, Wedderburn Castle. Mary was a writer, an author of Jamaican folk tales and other stories, and after her husband’s death she moved to the West Indies with her only son. Her friend Sarah Robertson Matheson was equally interesting. Born in Dunfermline, outside of Edinburgh, her father had been the Keeper of Dunfermline. She lived outside of Edinburgh, married, but had no children. She was also an author, writing patriotic, historical and romantic poetry, as was a prominent member of the Clan Donnachaidh (Robertson) Society. While researching these families and their connections to empire and the Six Nations, I was able to make contact with Milne-Home and Robertson descendants in order to share what I was finding in the archives. I found who I thought might be a descendant of Mary’s one son living in Australia, and since I couldn’t find an email address online, I mailed him a letter. And then, because it was 2008, his wife found me on Facebook and sent me a message: “Alison, are you the grad student doing a PhD on the Six Nations?” Well, yes I was! And so began a friendship (both on Facebook and in real life). I sent the family transcripts and copies of letters their grandmother had written and they sent me scanned images of photographs and of her postcard collection of Indigenous soldiers from the war. 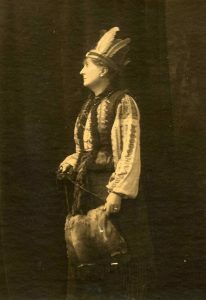 Because Milne-Home had befriended so many men, many sent her photo postcards, which she kept, and that her family now holds in their own collection. In 2014, the Woodland Cultural Centre was able to include some of these images in their exhibit on the First World War, and help to put a face to soldiers from a century ago that were otherwise missing. Through a local history society in Fife, I also was put in touch with a family member of Sarah Matheson, a cousin who was named for her, and we began corresponding about family history and what we each knew about this fascinating woman. While I was doing my research and family history digging, I saw a call for papers for a conference in Edinburgh, called “Gendering Imperialism: Home, Colony and the Construction of Gender Identities,” which seemed to be a perfect opportunity to both present what I knew so far, and to visit the Scottish National Archives, as well as the places these women had lived, and to meet some of their descendants and other family members. I presented my paper: “Transatlantic allies: Scottish women and the Six Nations of Grand River, Canada,” with Sarah Mathieson’s cousin in attendance, and I explored the places in Edinburgh that the contingent of Indigenous soldiers had done in 1916, including Edinburgh Castle. I traveled to Fife, Clackmannanshire, Perth and Kinross, and the Scottish Borders, visiting Wedderburn Castle (very Downton Abbey-esque), and other homes where these two women had lived. I also got to meet Sarah in person, and she invited me to stay at her home in Elie, and introduced me to steel cut oats and vegetarian haggis (I’m not vegetarian and it was delicious). We visited the homes where Sarah Matheson had lived, and from which she wrote her numerous letters to government officials in Canada, and found her grave stone in a local church. These two elite women, Mary Pamela Milne-Home, and Sarah Robertson Matheson, were both involved in volunteer work in Scotland in the First World War with the Victoria League, and both were in contact with and supportive of Deskaheh, or Levi General, and his efforts to fight for Six Nations sovereignty in the early 1920s. Both were advocates for Six Nations veterans in the years after the war, writing letters in support of their causes – Milne-Home often referred to her great great great grandfather’s history in North America and to some of the men at Six Nations whom she called “cousins,” seeing as some could trace their ancestry back to Molly Brant and William Johnson. They also (unsuccessfully) worked to establish a war monument to them in Edinburgh. I wrote a bit about these women many years ago in my dissertation, and presented another paper about them at the Berkshire Conference of Women Historians in 2011. I continue to look into the lives of both of these women, and consider how their activism in support of, and on behalf of the Six Nations was part of a larger story of non-Indigenous allies in the interwar years. In a way, it’s social history of Indigenous – non-Indigenous relations, instead of political history of those relationships, using sources beyond government records, and methodologies that can shed light on individual families and relationships. I’m working on an article to further flesh out the interwar activism of these two women. It seems increasingly important to try to understand these kinds of stories as so many of us non-Indigenous scholars, and Canadians more generally, work to build alliances with Indigenous people and work towards reconciliation a hundred years later. Alison Norman is a Research Advisor in the Ontario Ministry of Indigenous Relations and Reconciliation, and a Research Associate at the Frost Centre for Canadian & Indigenous Studies at Trent University. She is also currently teaching at the LIFE Institute at Ryerson University, and at Living and Learning in Retirement at Glendon College. See for instance Adele Perry. Colonial Relations: The Douglas-Connolly Family and the Nineteenth-Century Imperial World, Cambridge, Cambridge University Press, 2015. Been researching the link between Scotland/ Scottish women and WW1 First Nations soldiers for a few years. Fascinating stories and reinforces the bond and ties between Scotland and First Nations.